JUDY MESSOLINE: We have pretty bizarre things happen here. Most of the people I know down here have seen something bizarre at one time or another. No, we don’t discuss it a whole bunch, but they believe. They think there’s something going on, too. 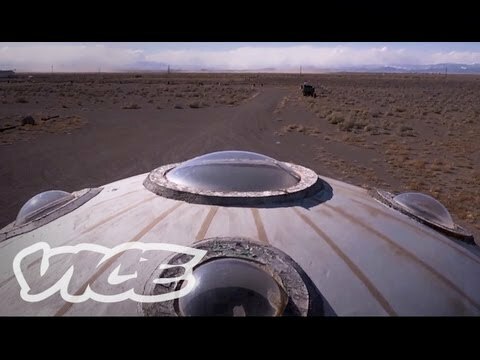 My partner and I moved to the San Luis Valley to raise cattle, did not move here for UFOs, and didn’t even realize that this was a hot spot of the nation for sightings. And I knew nothing about them anyway. Well, then I started meeting some of the locals down here. And they all had UFO stories– I mean, one after another after another, even to the point where there was a real estate company years ago that would make people who bought land from them sign a disclaimer saying that they were aware that there was UFO activity in this valley. So anyway, it got to the point I’d giggle and say, we need a UFO watchtower, never ever thinking I’d ever do it. Well, after four and a half years of struggling with cows, because they don’t eat sand really well, they about broke me. So I was talking to one of the farmers one day and I said, I’ve had to sell the cows. I don’t want to sell my land. And he said, you need to put up that UFO watchtower you giggled about. You’d have fun. It was just going to be a little old mom and pop business. We’d be open in the summer, closed in the winter, catch that tourist traffic off the highway, never thinking we would ever see anything from here. I mean, that was not even a vision. Well, from the time we opened, we started seeing things. And as of now, and this is November, we have had 67 sightings from just here since we opened. One night we had about 60 people over here. And there was a couple sitting up from on the bench. And the woman jumps up just screaming. Do you see them? Do you see them? They were so high up that if she hadn’t pointed them out, I would have never seen them. And there was one here and one here, and they were moving remarkably fast towards the north. The one in the front stopped, and it waited for the one behind to catch up. And when that one caught up, the two of them took off, and there was a streak of light across the sky. Another night it looked like a shooting star, and it was over here on the other side of the sand dunes. And it’s coming down. I’m watching this shooting star, OK? And it gets below the peaks of the mountains, and it lost its momentum, and it started to float like this. Well see, that makes sense to my weird mind. But anyway, what didn’t make sense is it went straight back up. So it wasn’t a shooting star. So many bizarre things have happened here in the last 12 years. And I tell folks, maybe you don’t quite get all of this, OK? But you better have an open mind, because something’s going on up there in that cosmos, so we just don’t know about. And do I believe now? You betcha. JAY YOUNG: I’ve seen some pretty strange things. I’ve seen things that I’ve never even heard of before. I think there’s a lot of things in this universe that we don’t understand, and maybe we’re not meant to. Elvis. Here, buddy, buddy. Oh, there he is. How you doing big dog? Hey. JAY YOUNG: How’s my big boy? Yes. How’s my big boy? I was born in Texas, but I had the good sense to move to Colorado when I was six months old and been in the valley almost ever since. My name is Jay Young, and I’m the manager of Colorado Gators Reptile Park. I’ve known Judy for quite a while, I guess. I went to the UFO watchtower probably the first year she opened it. It was a novel idea. She knew there was all these sightings in the San Luis Valley. And as she’s told you, I’m sure, she’s seen things since then. Do you know about Snippy the horse, right? First documented animal mutilation, possible UFO mutilation, happened here in the San Luis Valley back in the late ’60s. And it was a horse named Snippy the horse. It was just totally stripped bare. But where the meat ended on the neck, the flesh was cauterized. There was no blood in the horse’s body, and there were no signs of any predators or anything strange around it. We just found this horse with the flesh missing off of its head. And we had an ostrich disappear. It’s missing to this day. It’s been four years now. Nobody ever saw this ostrich. So we decided to name him Snippy, if he ever does show up. I think the San Luis Valley probably draws a lot of supernatural or extraterrestrial activity possibly because of the geothermal water. And there’s a lot of crazy people here who probably see things that they didn’t actually see, too. And then, the San Luis Valley draws strange people, so it might as well draw strange aircraft as well. JUDY MESSOLINE: Some say that its the vastness of the valley, because it’s so huge and not highly populated. Others say it’s a spiritually of the valley. Others say that there’s an E.T. base in Mount Blanca over here. Well, all of this sounds really good. But it didn’t make sense to my mind. Then I got a magazine from Great Britain. And in that magazine it said that the majority of their sightings was where there were hot water wells. That makes sense. From one end to this valley to the other, we have geothermal water. JAY YOUNG: We have very little atmosphere here at our elevation. We have very little pollution. We have very clear skies. We do a lot of watching just from our front yard. Judy built a nice place for people to go and hang out that didn’t have a front yard here. JUDY MESSOLINE: The folks who come here to visit, first thing I ask is have you ever had any UFO experiences? Some will come right out and say, oh yeah. But folks have made fun of them for relating their stories. And I said, how can people do that? People have these experiences, don’t make fun of them. DAN: Everyone, whether they’re skeptical or not, everybody wants to think we’re not alone. Yeah, I’ve seen lights in the sky and objects that seem to hover and then take off quickly. AMANDA: I was up in the mountains with my friend near Denver. And it was the middle of the day, and we saw something that was just hovering for a long time. It was just like an orb that was brightening and dimming. But it was still for a really long time, and then it moved. JOE: I just left my house. I was on my way into town and had some lights coming over towards us from where Blanca is. And as it was coming towards us, it seemed to come down, get brighter and brighter as it was coming down. It was a pretty good ways up there, though. And all of a sudden, it went from going straight at us and took an immediate right and went off and just disappeared off into the sky. KENNY: We have what we call the mystery lights. It’s lights we see over top of the mountains, not moving, not blinking. So it’s not really an airplane or nothing, doesn’t look quite like a star. So we don’t really know what it is, so we just called it mystery lights. JAY YOUNG: I’m driving up Highway 17 one night. I saw three lights off to the left. And then they went over the mountains in less than 10 seconds. I calculated it out that there was no sonic boom from them taking off, breaking the sound barrier. So that was strange. And then I calculated it out. They were going upwards of 21,000 miles per hour. JOSH: I’ve actually never experienced anything. And I’ve never seen anything myself in the area. But I believe it. In the cities and valley, there’s a lot of stuff going on, a lot of buildings. But out here in the open, you can really see everything in the sky. I’m sure there has been plenty of sightings out here. There’s plenty of room for it. JUDY MESSOLINE: If extraterrestrials were mean, we wouldn’t be here, kids. Because their technology is so much greater than ours. We wouldn’t be here. There’s a painting over there. And the woman who did the painting is an abductee. She has been abducted for, oh gosh, since she was just a child. And she’s 50 now. And now she tries to make it a positive experience. And yeah, she was scared. But that’s human nature. We’re going to be scared about the unknown. I used to watch Mulder on TV and stuff. But as far as really being into it, I was a horse person. I was not somebody that was out here staring at the sky all the time. Now, I wish I would have taken the time to stare at the sky, because there’s some amazing stuff that goes on up there. You look at all the turmoil that we go through here on Earth and the changes, and there has to be something better. .